Spider Chain of Lakes is located 14 miles northeast of Hayward, Wisconsin in Sawyer County. The Chain is comprised of five interconnected lakes, which include Clear, Big Spider, Little Spider, Fawn, and North. The Chain hosts a fishery for walleye, muskie, bass, and panfish. It is characterized by a rich underwater structure of reefs, points, and dropoffs, and large fish-holding cabbage beds abound. The demands of Spider Lake increase each year with the numbers and power of motorized vehicles on the lake. People come to Spider Lake for many reasons; some for solitude and silent sports, some for speed and adventure. 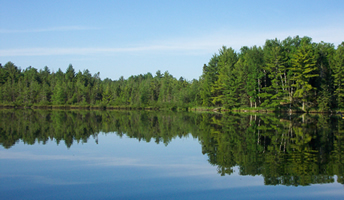 The Courtesy Code maintained by the Town of Spider Lake (in summer) is a means through which all people on the lake can enjoy it. If visitors, residents and guests adhere to the courtesy code and lake regulations, they show respect for each other and their entire lake community. Please ask your guests to respect our Courtesy Code, which provides quiet hours (<10 mph speed limit) before 11 a.m. and after 3 p.m.
-Shoreline homeowners with private launch ramps should thoroughly search for and remove any vegetation or marine life on watercraft and trailers launched at their landing site. -Water skis may be used between 11:00 am and 3:00 pm only. This includes all "towed activities" such as skiing, tubing and wake boarding/surfing. The spirit of this Town of Spider Lake ordinance is to provide peace and quiet, with no wake, outside the designated ski hours. It was originally created to protect the lake for fishing and quiet sports. Please respect this ordinance so that ALL stakeholders can find joy here. -Boats and personal watercraft (jet skis) have a 10 mph speed limit prior to 11:00 a.m and after 3:00 pm. -Boats are limited to Slow-NO WAKE within 100 feet of the shoreline. -Users of the picnic areas are required to clean up after each use. -Please refer to the Town of Spider Lake Ordinances below for additional detail. -Heed all state and local boating and fishing regulations (see links below). -Boats without motors always have the right of way. -Personal watercraft (jet skis) are restricted to slow-NO WAKE within 200 feet of the shoreline. -Water skiers (and tubers or wake boarders/surfers) and personal watercraft (jet skis) should stay in the middle of the lake to avoid sensitive wildlife areas. -Avoid making wakes around weed beds and along the shorelines. -Be respectful of the loons whose habitat we share. Thank you for making Spider Lake safe and enjoyable for all. Return to Wake Robin - One Cabin in the Heyday of Northwoods Resorts.pdf- a personal look at life on the Spider Chain of lakes from the 1920's through the 1960's, an era that many lake neighbors might not be familiar with.